This is not a practical flower; gardenias are hard to find, last only a short while, and leave a lingering scent so full of longing that she may go her whole life seeking it out once again. You do not bring a woman a gardenia flower to be practical. This is the large, white bloom in the hair of Billie Holiday; the one tied to the delicate wrist at a debutante’s ball- the flower pinned in the veil of the most memorable day of a woman’s life. This is the flower you give to someone whom you hope will remember you always and will do so every time she catches the faint scent of gardenias blooming on a summer night. Cultivated in China for at least a thousand years, gardenias were brought to the gardens of Europe in the 18th century and named personally by the great botanist and taxonomist, Carl Linnaeus. 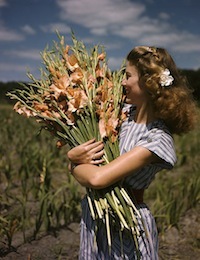 Their migration to the New World found the perfect home in the warm, humid regions of the south and their rich, sweet fragrance became an iconic scent of mid-spring to early summer in Georgia and the Carolinas. The shiny evergreen leaves of this shrub are wonderful landscape plants and those that migrate from the South to cooler climates will try their hand at growing it as a houseplant if for just one sweet bloom to remind them of home. Gardenias will not be found in the cooler of your local florist. This is the flower worth calling about one week in advance. 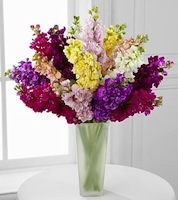 It will be ordered specially and available to you as a cut flower or tropical, potted plant. The white blooms are large and so finely crafted they look almost to be carved from ivory. 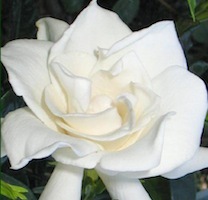 Depending on the cultivar, your gardenia may be a pure and lovely white or have some central petals that shade to a buttery yellow towards the center. The glossy green of gardenia leaves will suit it better than any other accompanying flower or green, so don’t dilute its beauty with any other stems. Simply and elegantly displayed on the body or floating in a vase, there is nothing more lovely as a lone gardenia. Keeping the blooms moist, but preventing actual water drops from landing on the petals will help each flower last its longest. Remember, you did not buy this flower to be practical. You bought this flower to make a memory that will last far longer than any other flower ever could.